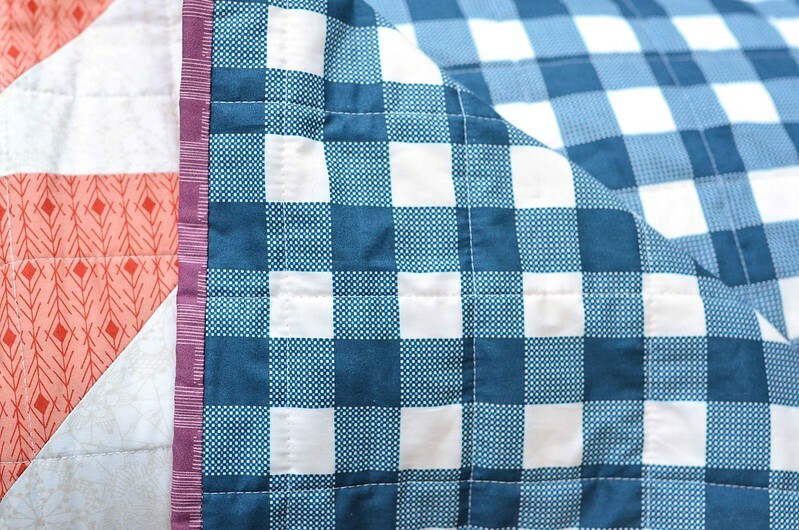 Art Gallery Fabrics and the Fat Quarter Shop have teamed up again with another free pattern: the Blithe Quilt. It is made up of big-ish half square triangles so it is pretty quick to piece together, but it packs a lot of visual punch. I chose to use mostly Maureen Cracknell prints for my quilt. About half of them are from her first collection, Wild and Free, and most of the rest of them are from her newest collection, Fleet and Flourish. There is also a Pure Elements Solid (it's called Ocean Waves) and one print from Bonnie Christine's collection Succulence. The colors of Maureen's collections are amazing, they have such a calming effect on me. As much as I love bright and loud colors, these colors are much more "me" in real life. Instead of a random layout I decided to go a little rainbow-y. Even though the rainbow isn't perfectly balanced, it makes me happy. The backing fabric is this great print from Wild and Free. I quilted it with a 3" grid to mimic the fabric on the back of the quilt. The binding is the purple print from Fleet and Flourish which I chose mainly because it is my favorite color ever. This quilt is available in my Etsy shop. Finished size: 54.5" x 72.5"
Do you want to make your own Blithe Quilt? Very nice! I really like this variation on a HST quilt. Great quilt, Erica. I so love the fabrics you chose and how well you put them all together. Great job. 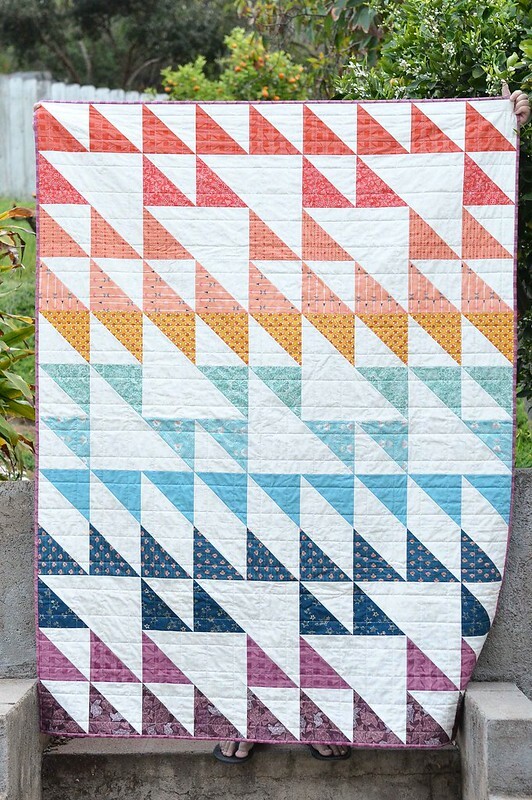 Love this quilt too. Awesome !! I love your take on the pattern, the rainbow gradient looks great! Balanced or not, the rainbow effect is working. 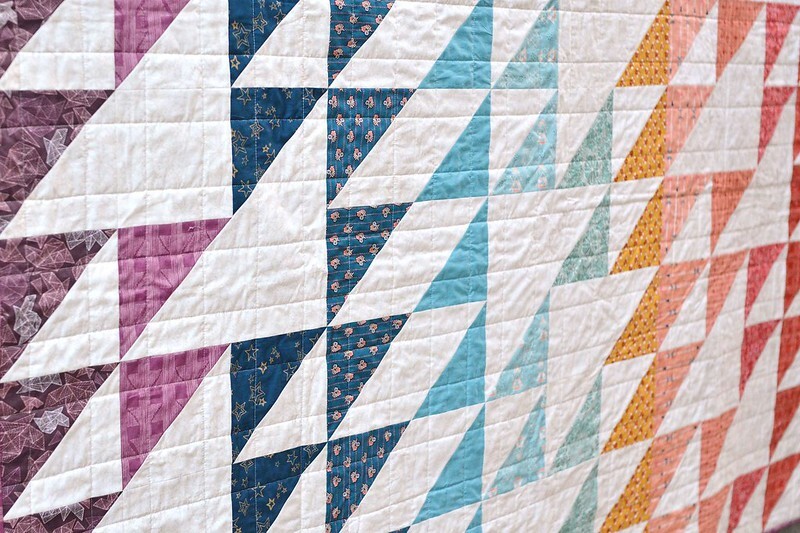 Your choices make for a very pretty quilt Erica! I can see why Maureen's fabrics calm you, the combination of colors is lovely.